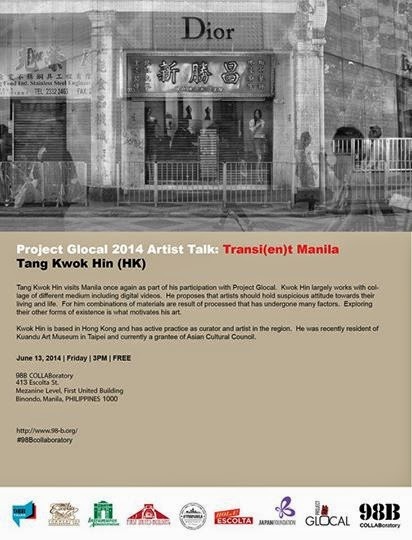 Project Glocal invites everyone to an artist talk by Tang Kwok Hin on June 13, Friday at 3PM at 98B in Escolta, Manila. Join Kwok Hin as he visits Manila once again as part of his participation with Transi(en)t Manila. Kwok Hin largely works with collage of different medium including digital videos. He proposes that artists should hold suspicious attitude towards their living and life. For him combinations of materials are result of processed that has undergone many factors. Exploring their other forms of existence is what motivates his art. Kwok Hin is based in Hong Kong and has active practice as curator and artist in the region. He was recently resident of Kuandu Art Museum in Taipei and currently a grantee of Asian Cultural Council. The talk will be held at 98B's COLLABoratory at the Mezanine Level of the First United Building, 413 Escolta Street, Binondo, Manila. Admission is free.